The London restaurant scene was revolutionised and democratised in the early 90s by Terence Conran and Joel Kissin, the partners in Conran Restaurants who lit the city up with Le Pont de la Tour and then the mega-brasseries Quaglino’s, Mezzo and Bluebird. Conran was the frontman using his creative vision and sense of style whilst Kissin was working behind the scenes bringing his natural restaurateur’s flair and operational skills into play. The London scene felt as if it was alive, buzzing and glamorous again after decades of sterility. Kissin and Conran parted company over plans for a North American expansion and the group (now run as D&D) lost its mojo somewhere along the way. 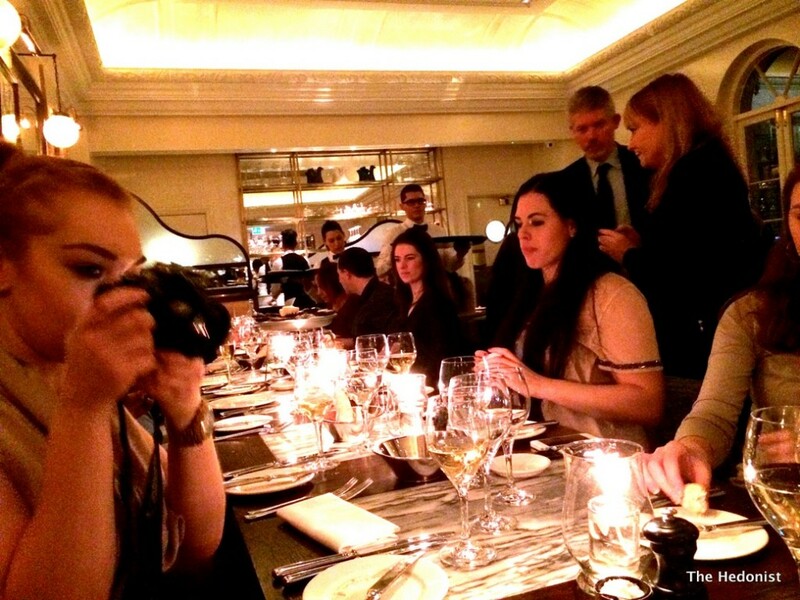 Kissin stayed in the USA developing property but returned to London a couple of years ago to open Boulestin around the corner from Quaglino’s in St James’ with head chef Andrew Woodford running the kitchen. 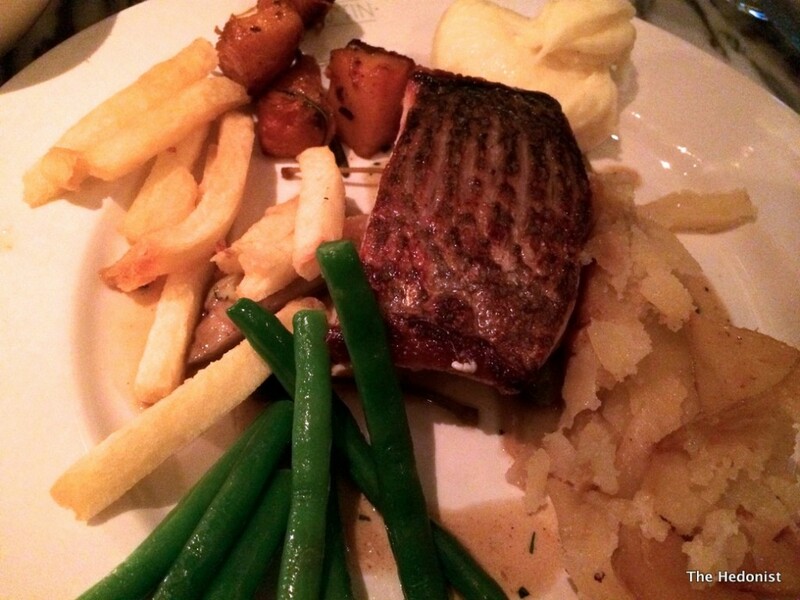 The restaurant is named after Marcel Boulestin, French chef who opened his Covent Garden restaurant in 1926 and went on to be the UK’s first TV celebrity chef. Although the menus are not recreating Boulestin’s recipes (there is a Christmas menu running alongside the à la Carte), they still read like a hymn of praise to classic French cooking with dishes such as fillet steak, foie gras & Madeira with truffles and daube de bœuf & purée de celeriac. The good news (for me) is that I have been asked along with a blaggle of bloggers to try out the wine and food. 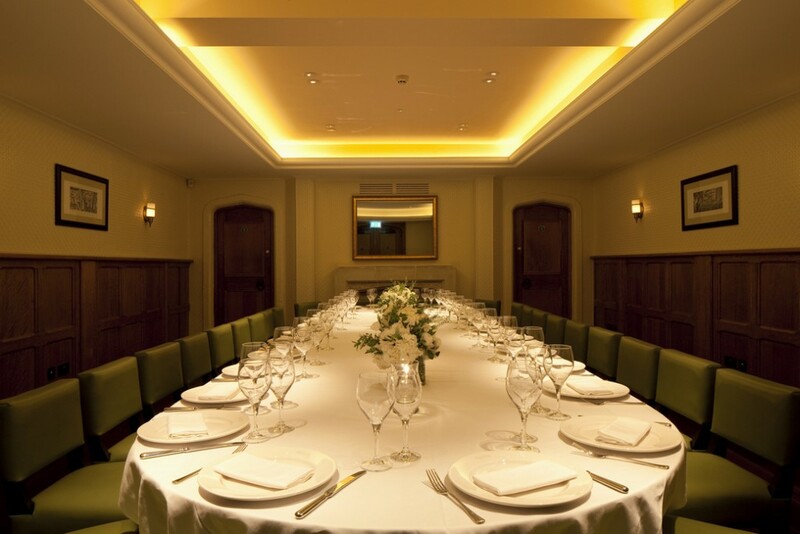 For the Christmas party season Boulestin has three different spaces in which to celebrate ranging from the wood-panelled Private Dining Room seating from 8 to 40 (pictured above) to the main room and then the less formal Café Marcel which sits at the front of the restaurant. Christmas menus will be available at Boulestin from November 1st until December 24th and Private Dining Room guests can choose from a selection of set menus starting from just £50.00 per head inclusive of filter coffee and petit fours. But what about the food? 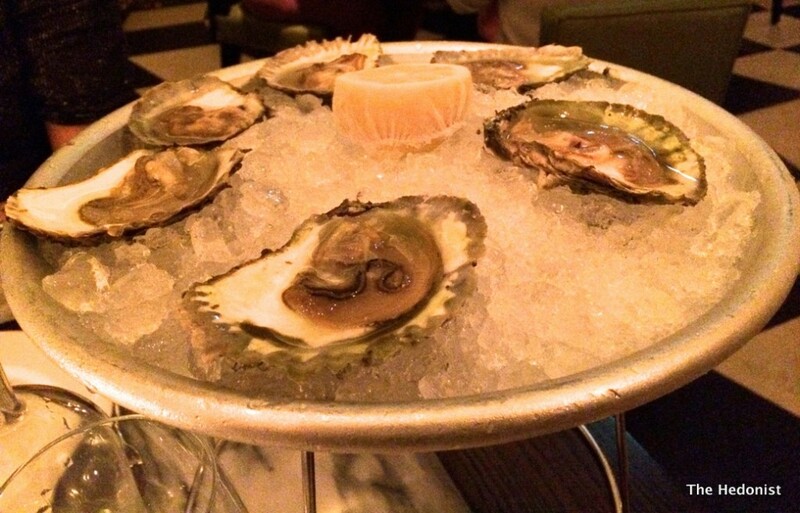 Duchy of Cornwall Native No 2 oysters were deliciously plump with a firm saline bite, imagine Scarlett Johansson wearing a bikini in the Atlantic… and washed down by a deliciously crisp and citrus glass of Les Templiers, Chardonnay, 2012, Cotes de Thongue. 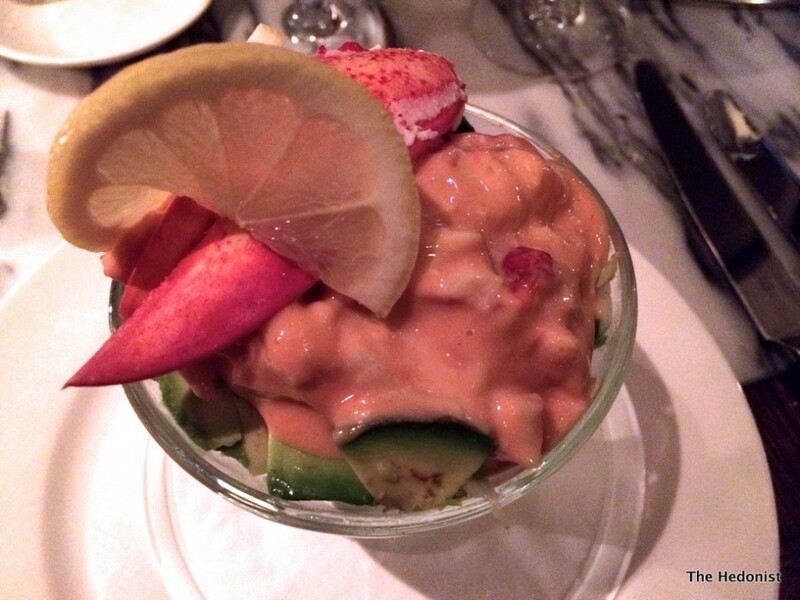 Lobster and prawn cocktail is often served with a knowing wink to the past. This one was determinedly unironic with an exquisitely piquant Marie-Rose sauce that allowed the flavours of the seafood to flourish and not be overwhelmed. 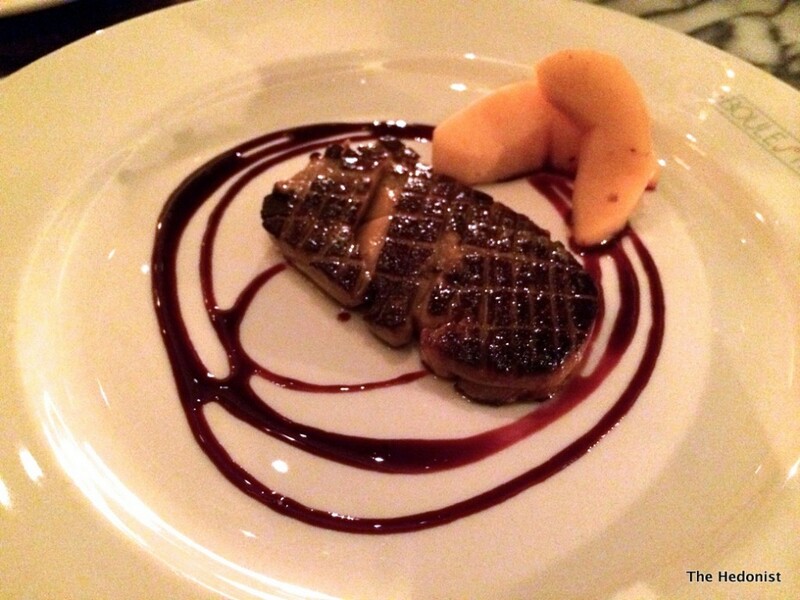 Pan fried Foie Gras came with roasted quince and was the real deal-beautifully seared on the outside and with an intense flavour profile. 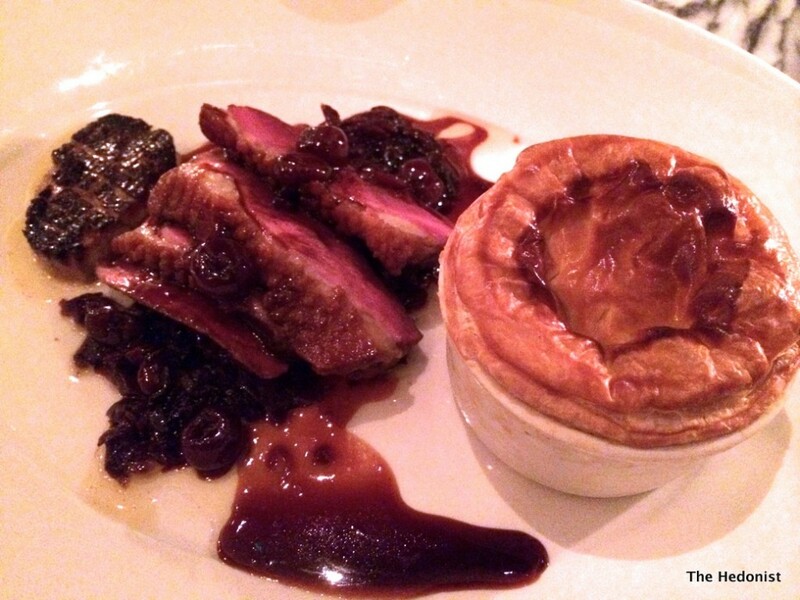 We moved onto a glass of intense fruity, spicy red wine , an Italian Primitivo, Visconti dell Rocca- a perfect match for the tender and flavourful Roasted duck breast, Duck en Croute, Spiced red cabbage pan fried duck liver with a cherry jus. 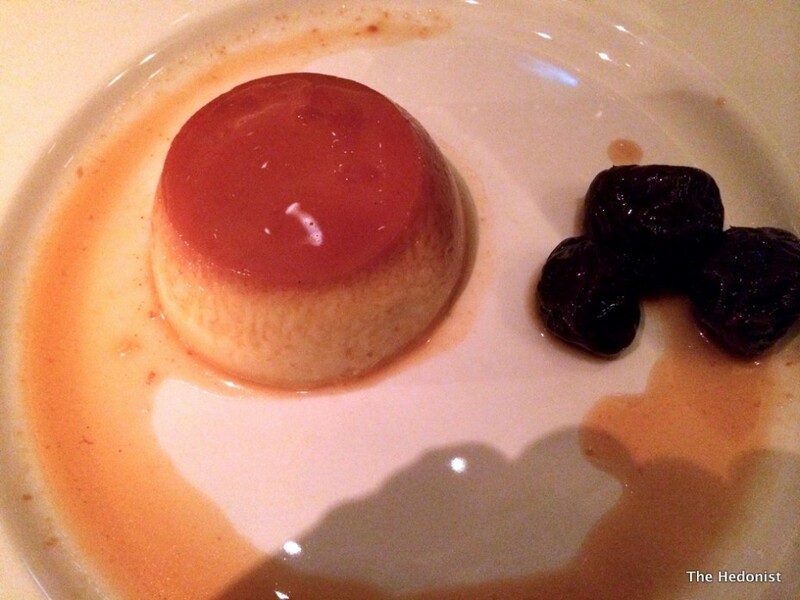 The Crème Saveur Sauternes served with Agen Prunes in Armagnac was an incredibly creamy Sauternes-flavoured custard with the accompanying prunes having that distinctive Armagnac bite. 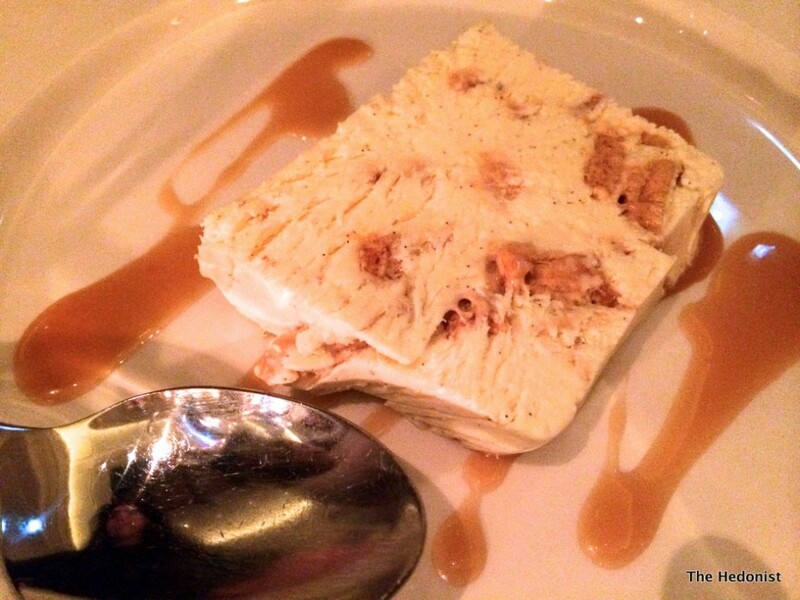 and finally Frozen honeycomb parfait with caramel sauce was like a semi-frozen gooey Crunchie Bar-sweet but delicious. 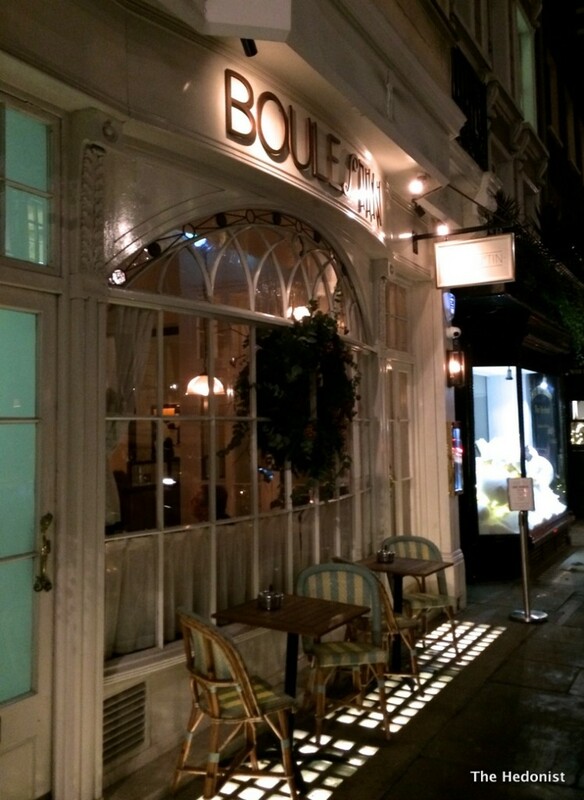 If you are looking for a central London venue for your Xmas celebration, any other event or just a great meal out, then Boulestin should be high on your list. It’s probably not for edgy, hipster types but if you enjoy eating a really high standard of bourgeois comfort food in stylish surroundings with very convivial service it will probably be your bag. It’s not cheap but with the variety of dining options available a meal there need not break the bank.